Vye have fit a lot of features into this small case, but is it too much? Optical drive in a netbook! The Vye SX3 netbook stands out by virtue of being the first netbooks to feature a built-in optical drive. It is one of the best-specified netbooks around, but it doesn't come cheap and fails to provide a rounded experience for the end-user. The inclusion of a DVD drive provides great flexibility. It means you can install software on to the machine with ease, as well as burn back-up discs of your work and even watch DVDs on the go. Surprisingly, this hasn't negatively affected the machine's portability, with the 1.3kg weight fairly standard for a netbook. The 310-minute battery life is also impressive, particularly since it is delivered by a compact, 3-cell battery. Image quality from the 8.9-inch screen is fantastic with great detail provided by the sharp 1280 x 768-pixel resolution. 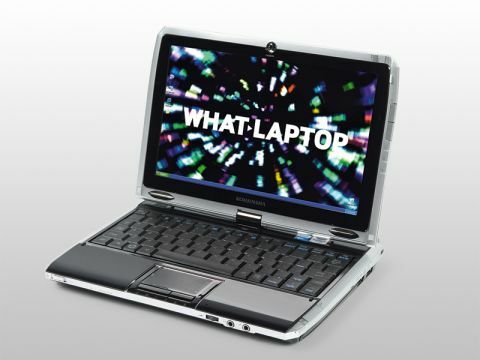 It also features touchscreen control, enhancing the netbook's overall usability. The keyboard is of average quality. It's rather small, which can lead to frequent errors. It is also quite bouncy when typing. The chassis itself is constructed from a durable matt-black plastic with a silver plastic trim. It feels far cheaper to touch than we expected at this high price. Window's Vista is the operating system of choice and, while daily performance was reasonable, the machine would have been much faster had Windows XP been used. The 60GB hard drive provides limited storage and is vastly bettered by netbooks half the price. There are also three media card readers in various places around the chassis – including a microSD slot for your phone – to expand your options. Connectivity is fairly standard, with 802.11g Wi-Fi on offer, and also 10/100 Ethernet. The inclusion of two USB ports is just about acceptable, and a VGA-out rounds off the specifications. The Vye SX3 is a mixed bag. While it has some excellent features, such as the DVD drive and brilliant screen, it is poorly made and extremely expensive and, as a result, it doesn't really come together as a compelling choice.